The Uncut Version including Part One on Amazon.com! Comparison between the cut British DVD from Castle (BBFC 15) and the uncut American DVD from Universal (PG-Rated) from the Franchise Collection box. Running time differences due to logos are not listed. As Conan is attacked by soldiers on horseback, the falling horses have been cut when he rips the men out of their saddles. Conan smashes his fist into a horses face and it breaks down. Another fall of a horse has been cut. 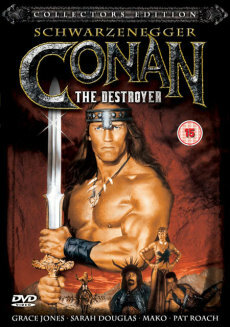 When Conan meets the camel from the first movie and it spits on him, him knocking the animal unconscious is missing.